Dove spent some time last week as the laughingstock of the internet, but the brand’s recent ad campaign won’t tarnish its shine as a beloved brand. When the Unilever brand unveiled the latest iteration of its “Real Beauty” campaign, which featured bottles intended to reflect the different shapes of women’s bodies, there was an immediate backlash from Twitter users, as many pointed out what might sound good in an office won’t translate to the greater population, and others made jokes. But the online ridicule did not dent people’s love for Dove, according to Morning Consult polling, which showed Americans rated the product above competitors such as Olay and Nivea. And some even considered Dove’s curvier or skinnier bottles a boon for its image. Eighty-two percent of people said they have a favorable view of Dove, and 68 percent said they plan to buy a Dove product over the next three months in the poll, which was conducted after shortly after Dove launched its ad campaign. Forty-one percent of people said they had a more favorable view of Dove after seeing the “Real Beauty” images, and the same number said it made no difference either way. Nine percent of people said the images gave them a less favorable view of Dove. Representatives from Dove and Ogilvy London, which according to media reports was the agency responsible for the ad, were not immediately available for comment. While the ad was meant to be the next installment of a campaign that promotes a body-positive lifestyle, it missed the mark because it presented people with objects they could troll instead of using real and diverse people, said Andrew Walen, the founder and CEO of the Body Image Therapy Center in Washington, D.C., and Maryland. “The more we dehumanize the experience of having different body types, the easier it is to say there’s something wrong with you,” he said. 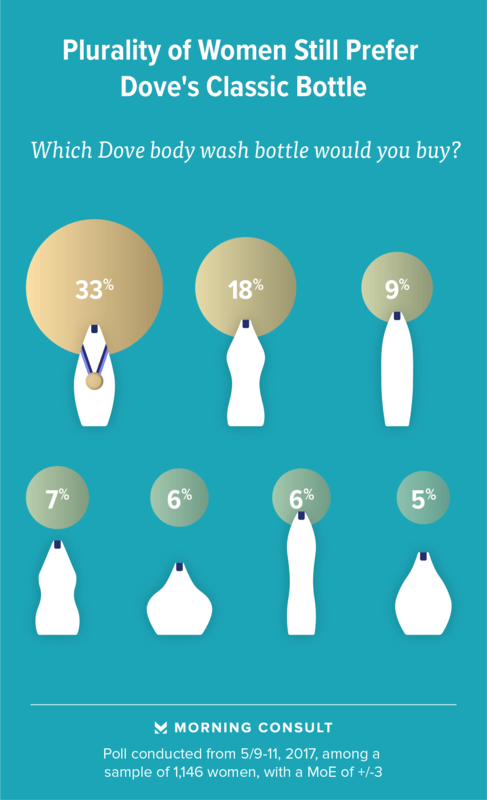 When respondents were asked how likely they were to purchase Dove products after viewing the new bottles, 71 percent said they were likely to patronize the company, a three percentage point increase from before they were shown the ad. 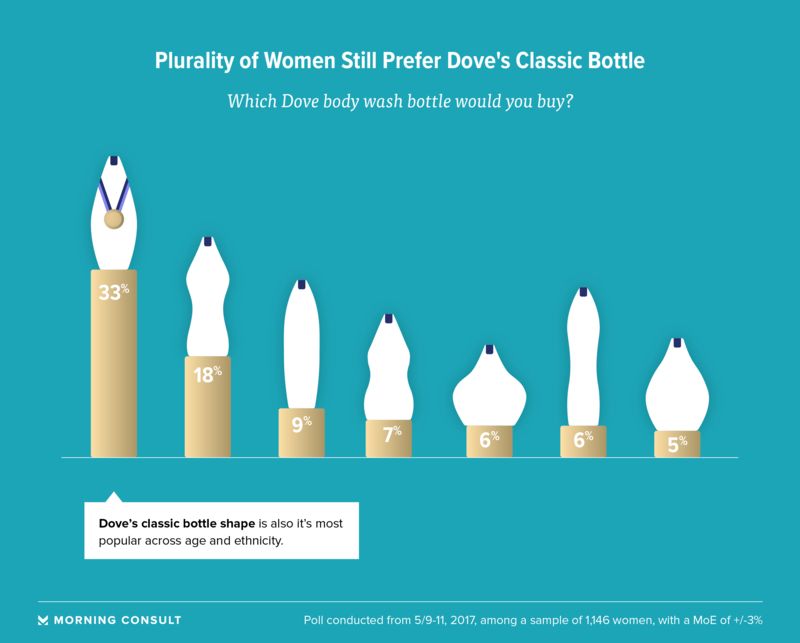 But consumers are likely to stick to what they know, as a third of people, a plurality, indicated they would choose the first bottle — or the standard-shaped Dove bottle — out of a lineup of the Real Beauty bottles. Polling was conducted among 2,209 adults May 9-11. See full results here.